Trump’s legal team is seeking clarification on whether the president would be interviewed directly by Mueller, as well as the legal standard for when a president can be interviewed, the location of a possible interview, the topics and the duration. But the president’s team is also seeking potential compromises that could avoid an interview altogether, two of those interviewed told NBC News. With the possibility now looming that the president himself could be subject to an interview by the FBI or Mueller’s investigators, Trump’s legal team has been debating whether it would be possible to simply avoid it. One individual familiar with the strategy said those internal discussions within Trump’s legal team began shortly after the president’s former campaign manager, Paul Manafort, was indicted in late October for money laundering in connection with his business dealings with Ukraine. 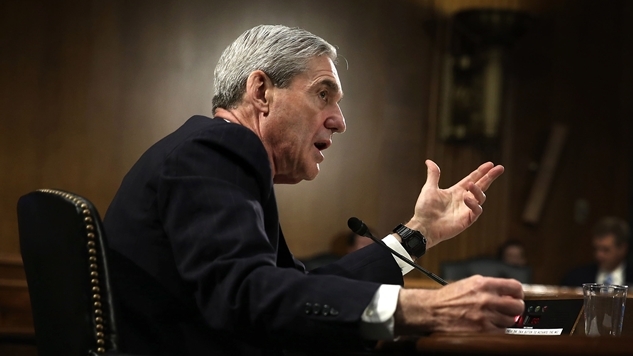 One person familiar with the discussions said Mr. Mueller appeared most interested in asking questions about the former national security adviser, Michael T. Flynn, and the firing of the F.B.I. director, James B. Comey — not the broader question of possible collusion with Russia. Those topics signal an interest in whether Mr. Trump tried to obstruct justice. Greg Sargent of The Washington Post added one more nugget on top of this story. It's now being reported that Mueller wants to interview Trump about obstruction. Mueller wants to ask Trump if he told Flynn to lie to the FBI, a former WH counsel tells me. This will also require extensive preparation from Trump. As tantalizing as the “why” behind the obstruction of justice inquiry is to dig in to, the “who,” “what,” “where” and “how” paints a seriously dire picture for the president. Trump practically confessed to obstruction of justice on NBC News after firing James Comey—proving that he had the Attorney General and Deputy Attorney General draw up a phony legal recommendation to serve as cover for firing the former FBI Director. Republican Senators have gone on the record to tell the Times that Trump asked them to squash their Russia investigation. The former FBI Director wrote in a note that Trump asked if he could see to “letting [his National Security Adviser] go.” This is serious stuff, and the fact that Robert Mueller wants to speak to a president constantly unmoored from the truth (he was caught lying 30 times in a 2007 deposition) should send chills down everyone’s spine in the White House. The natural question then becomes: if Mueller does conclude that Trump obstructed justice, what happens then? Impeachment is the natural thing to pivot to, but that’s a political question—not a legal one. Given how Congressional Republicans have sprinted away from owning any of Trump’s missteps, it seems highly unlikely that they would work up the courage to impeach any Republican President. However, that is not the end of the road. It used to be a common belief that it was not possible to indict a sitting president, but the NYT uncovered legal memos from both Richard Nixon and Bill Clinton’s defense teams which argued that sitting presidents could be indicted. In fact, there is even a legal precedent for this case in the form of Clinton v. Jones. In 1997, the Supreme Court ruled that Paula Jones did have legal standing to bring a civil lawsuit against President Bill Clinton. One would assume that if it has been established that a civil case can be brought against the president, then a criminal case is even more likely because that is far more in the public’s interest than a civil suit. So it is possible that Robert Mueller’s inquiry winds up indicting President Trump, and the Republicans do nothing about it—preferring to work with an indicted president instead of impeaching him and working with Vice President Mike Pence. If you’re holding your breath that Robert Mueller’s investigation will bring the end of President Trump, exhale. Trump really could stand in the middle of 5th Avenue and shoot someone, and the GOP would do nothing to punish him. Best case scenario: the Republican Party spends time supporting a literal criminal president, and then pays for it dearly at the polls. Votes, not indictments, are how we rid ourselves of this orange banshee unfit to serve in the Oval Office.